Experts say antibiotic-resistant microbes may be spreading from hospitals to other health care facilities because of transferring patients’ dirty hands. And new research in Southern California raises the concern that existing treatment municipal treatment plants may lack the sanitizing punch needed to kill superbugs (such as the CRE microbes shown) flushed from hospital and other health care facilities into sewer lines. The supposedly treated water, too frequently with flourishing super bug colonies, then gets dumped into oceans. As National Public Radio and other media have reported, hospitals and other care facilities have campaigned to get caregivers—nurses and doctors—to scrub their hands to prevent the spread of nasty and often deadly infections, particularly with virulent antibiotic-resistant bugs. Some institutions also have strongly encouraged patients’ families and visitors to sanitize their hands. About 2 million people get sick every year with antibiotic-resistant infections in the U.S. and about 23,000 die. The Centers for Disease Control and Prevention says one in 25 U.S. hospital patients has caught an infection while in the hospital. The initial step in curbing the recently identified means of transmission is easy: Get transferring patients to scrub their hands. But, researchers noted, this is only a first step. All manner of treatment facilities need to emulate hospitals extensive efforts to improve hygiene, and not just with the hands. Acute patients get moved around a lot through various care settings, and if they have superbugs on their hands, the infections are likely prevalent in or on them elsewhere, too. Wherever and whatever these infectious patients come in contact with, therefore, needs to be cleaned vigorously and frequently. Approximately 15,000 [long-term care] facilities in the United States provide care to an estimated 1.7 million people. They serve patients whose often complex medical needs leave them susceptible to illnesses that can lead to death, and to higher health care costs. Infection rates among [their] residents nationwide are estimated to be as high as 12 percent, with pneumonia and urinary tract infections being the most common. Meantime, water quality experts, based on their increasing monitoring, are growing more concerned about municipal treatment plants’ ability to kill superbugs flushed into their systems by local hospitals and other health care facilities. Indeed, the plants may be providing “luxury hotels” for antibiotic-resistant and other powerful microbial menaces, the Los Angeles Times reports. That’s because chlorine, the most common water disinfectant, can’t kill many virulent infectious agents, the Environmental Protection Agency has found. Further, many treatment plants pump oxygen and other, less powerful germs in waste sludge to get it to break down and become safer. But this provides rich breeding grounds for superbugs. 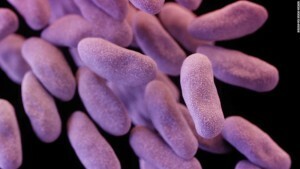 Officials are watching warily as increasing numbers of people report superbug infections, even though they have not undergone hospital or medical care. Many of these are surfers and swimmers who play in ocean waters where supposedly safe, treated water from municipal plants gets dumped. As of now, hospitals and other health care facilities are not required to quarantine their waste water; inside such institutions, staff may be required to follow rigorous protocols to handle patients with significant infections. But even patients with the fast-spreading, deadly Ebola virus were allowed to use hospital toilets, though workers at water treatment plants were warned to don protective gear for a time in case they were exposed to the waste. Among the superbugs that worry experts are the “nightmare” germs known as CRE, or carbapenem-resistant enterobacteriaceae. CRE-infections were implicated in seven patients’ deaths in Los Angeles, a lethal outbreak that eventually led investigators to the maker of a dirty diagnostic device used in endoscopic exams. I’ve written about how this sordid scandal has unwound, including a huge fines the manufacturer has agreed to pay to settle federal prosecutors’ kickback charges. Although some experts have tried to raise the alarms about this situation, The Times says it may be falling in regulatory gaps: It’s unclear which government agency should take charge to try to regulate or resolve the problem. California officials say they don’t know what infectious bugs exist or thrive in the ocean off the state’s coast. Meantime, the New York Times offers a worrying commentary piece that argues that the global battle to curb antibiotic abuse may be faltering.